Ideal for filling gaps n your borders. Polyantha Roses - AMAZING quality and SUPERB value for money, they are extremely popular for the continuous waves of vibrant flowers they produce. They are winter hardy, compact and have a high disease resistance - the perfect ground-cover rose and one of the best that you can buy! 'The Fairy Pink' produces masses of double, light pink blooms, over glossy green leaves - perfect for flower borders or patio pots - filling your garden with colour from June to November. Colour: Pink. Fragrance: 0/10. Height: 60cm. Width: 100cm. Flowers: Jun - Nov. Supplied as a professional quality plant in 2L pot ready to plant now. Making a welcome return to UK gardens, 'The Fairy' is a variety of Polyantha rose, a small, vigorous rambler with a low-growing habit which is invaluable as groundcover and perfect for filling patio pots with colour. AMAZING quality these roses are SUPERB value for money. A great successor to the popular flower carpet roses, what these roses lack in fragrance, they certainly make up for in looks and performance, producing wave after wave of perfectly formed rose flowers in large, closely packed bunches. These contrast magnificently against the glossy green leaves, which really highlight the colours, making the blooms 'pop'. As well as their gorgeous looks, 'The Fairy' series of polyantha roses are also extremely hardy with good disease resistance, forming neat, compact bushes which makes them ideal for growing in patio pots and the front of flower borders. 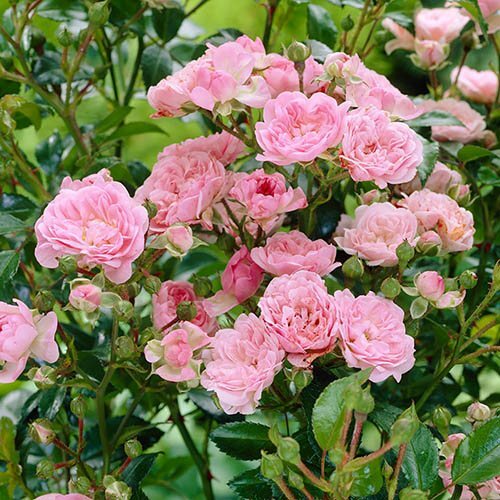 Flowering continuously from June until the first frosts, these delicate little roses are extremely versatile and very low maintenance, which makes them the perfect addition to your garden where they can be left to get on and do what they do best! Rosa 'The Fairy Pink' is a soft pink with rosettes of gorgeous double blooms. Forming a well-branched plant with typical glossy, dark green leaves, Fairy Pink is undemanding and flowers well into the autumn. Growing to just 40 - 60cm (2 - 3ft) we send a professional quality plant in a 2L pot ready to plant now. Supplied as an established plant in a 2L pot, ready to plant out now. Low growing at just 40-60cm high and 100cm wide. Plant en-masse for spectacualar groundcover or an eye-catching low hedge. Grow in fertile, moist, well-drained soil in full sun or partial shade. Provide good air circulation and remove fallen leaves and faded flowers to keep plants in tip-top condition. In late winter or early spring, prune hard (back to 10 -18 inches) and reduce sideshoots to 2 or 3 buds. To renovate out of condition plants, or to add renewed vigour, prune one in three stems close to the base. To prune, you would traditionally cut just above a leaf joint with a sloping cut away from the bud, however, this isn't necessary, and don’t worry about pruning too much - roses are very resilient and will grow back.